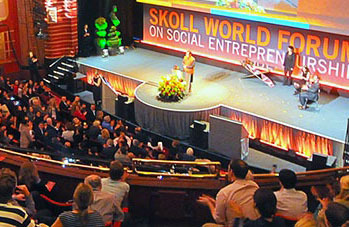 The Skoll World forum, fittingly held at Oxford university, has become a stand out event in the global development calendar where academics, entrepreneurs from the profit and non profit sectors, government officials and media gather on one of the most famous sites of education in the world and share ideas. However, while the students are tucked away in library carousels studying historical texts, attendees of the Skoll World Forum are in lecture theaters discussing the very imminent and present issues facing our world today. With this in mind, it is no wonder that Skoll World Forum founder Jeff Skoll singled out climate change as a main point of focus in his opening speech. The theme of this year’s event was ‘fierce compassion’, something that he said will be a definitive element in the race to fight climate change. To explain what is meant by fierce compassion, he alluded to the great philosopher Adam Smith in saying ‘it is to join in fellowship with others, to act and intervene and be fierce in response to crisis’. The more that we read evidence of climate change, open our ears to research and engage in cross industry dialogue, the more we realize that it has been caused by a collective intense use of resources and will be reversed only by a collaborative effort. 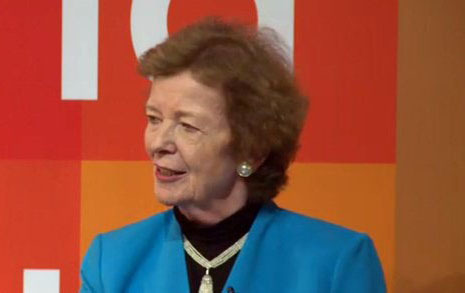 Mary Robinson, Former President of Ireland and current President of the Mary Robinson Foundation for Climate Justice emphasized that it is an issue that goes far beyond the atmosphere, it is an issue of human rights. Mobilizing developing countries to be able to insulate themselves from climate change is crucial. These are the people that stand to feel the effects the fastest – food security issues, increasing drought, erosion of infrastructure. “We need to exercise compassion and reach the furthest behind first, there is 1.3 billion people with no access to energy. We need finance and a transfer of technology to the marginalized, to enable them to make the very necessary leap into clean energy solutions”, Robinson said. There was certainly an air of progress around the forum this year. Last year, people were full of ambition in what could be achieved and certainty on the developmental challenges that had to be met, however this year there was the addition of the COP21 agreement. Post-Paris, we have set specific goals and each country’s performance on them will be measured. We have set a 1.5% limit on carbon emissions with 5 year commitment periods, meaning progress of all 195 countries that signed will be tracked and evaluated. By the second half of this century, we have pledged to have carbon emissions at 0%, a monumental goal but a firm belief that there is no alternative, we are moving in the direction of a post carbon economy. Aside from climate change, the ongoing refugee crisis that is engulfing Europe and the Middle East was also singled out as one of our most immediate threats to society at present. Similar to climate justice, it has now become an issue of human rights. Every human has the right to live; this right is being violated by the civil unrest in the countries they are trying to flee. So when they are denied entry to a safe country as is happening in many European States, it can be argued they are being denied the basic right to life. The narrative for many countries defending their borders has been that refugees will take advantage of their social welfare system, however, for the majority of people fleeing from Syria, peace is wealth. Jeff Skoll asked the audience to strip away all of the debate around free movement and pressure on resources and look at the moral choice – what is right and wrong, should these people be given the chance to live or die? It is here that social entrepreneurs, like many at the forum, can play a pivotal role. The perception of refugees needs to be changed, NGO’s and social innovators can engage in creative capacity building, maximize their potential, integrate them and make them productive members of society. It is likely that these efforts will be met with the utmost energy, there is nobody more enthusiastic and innovative than someone looking for a new future, for themselves or family. The central role of social entrepreneurs and voices of social good, like Horyou in facilitating this change was highlighted throughout the forum. However, as mentioned at the beginning, there will need to be collaboration across industry and government at every level and at scale to achieve the development goals we have set out. Horyou values such as compassion, positivity and solidarity reverberated through the audience at the end of the closing session. The overall sense to take away from the forum, in terms of international development, was one of hope but also urgency. The Paris agreement and the recognition that the migrant crisis is the responsibility of every state gives solid ground to move forward on. However, the time for discussion is over. With every day that passes, there is another casualty of drought in Mali or another refugee lost at sea. Climate change and the migrant crisis, the two defining developmental crises of our time, cannot be cast off as issues of the environment or finance or politics, they are issues of human rights.